In a large bowl, combine fruits and extract; toss to coat. In another bowl, combine sugar, tapioca, nutmeg and salt. Add to fruit; stir gently. Line a 9-in. pie plate with bottom crust; trim pastry even with edge. Stir lemon juice into fruit mixture; spoon into the crust. Roll out remaining pastry; make a lattice crust. Seal and flute edges. Bake at 400° for 20 minutes. Reduce heat to 350°; bake 30 minutes longer or until the crust is golden brown and the filling is bubbly. 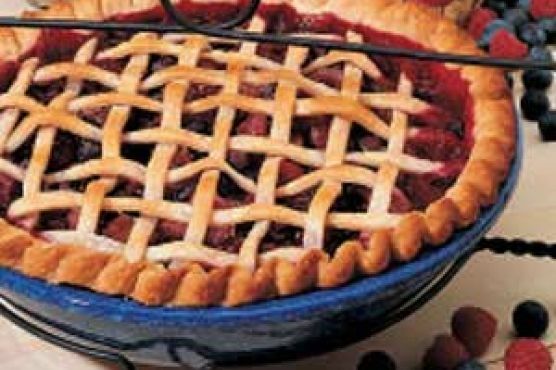 Lambrusco Dolce, Late Harvest Riesling, and Vin Santo are great choices for Pie. These wines are all sweet, which is important since wine should usually be sweeter than the food you're pairing with it.